The "Freds" and Joe went for a little trip to Allentown, PA to see how the new NS is doing with the old Conrail. We were in for a pleasant surprise. There was so much traffic, we saw trains everywhere we went (granted, some were being restored). UP motive power at the Bethlehem, PA Trailer/Van facility. What a find. Acording to the paint stencil on the long hood, the GP-60 was only painted the week before. Now a quick look at the shadow side. Lots of strange power in the new home of Norfolk Southern.The UP engine is a former SP GP60 and was just repainted on the 4th, a week before our trip. So it's a Western merger locomotive working on a eastern merger railroad. 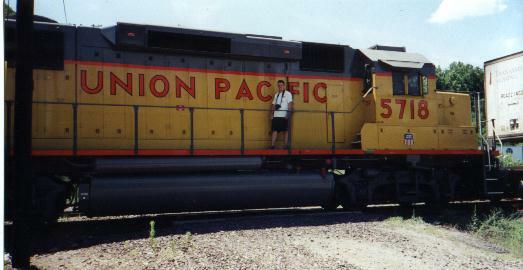 After talking to the Conrail crew, Mike (the UP fan) got permission to go up on the unit. I assume that this will be one of the next modeling projects for Mike. Needless to say, he was spent. Here they are...UP GP-60 #5718 and Norfolk Southern (ex-Conrail) GP-40 #3332 get ready to take another intermodal train out of Bethlehem, PA. Ah, the beginning of another successful Fred trip across Pennsylvania. Conrail wide cab Maybe SD60m or SD70 5560 leads a group of NS -8s 9105 & 9181 under the New Street bridge in Bethlehem, PA. The mixed freight is on its way to somewhere from Allentown yard. The same train passes by the remaining blast furnace of the Bethlehem Steel plant in Bethlehem, PA.
A different group of NS power leaves Allentown heading for Reading, PA. Ex-Conrail GE Dash 840C 8312 leads NS 6504 SD-70 and another -8.